Aeronautic dentistry seems like a fairly unique field, but a review article about keeping teeth healthy in outer space has been retracted from the International Journal of Stomatology & Occlusion Medicine for not being quite unique enough. “Aeronautic dentistry: an upcoming branch,” a review article, appears to have lifted pieces of other works “verbatim and without citation,” according to a representative from the journal’s publisher. The amount of material which seems to be plagiarised was not done intentionally. This article has been withdrawn by Professional Media Department, Springer-Verlag Wien due to proven plagiarism. Various orofacial structures are affected in an outer space. An aeronautic dentist has to be prepared to screen and select only those astronauts with optimal oral health. Also, an aeronautic dentist has to be prepared to face any emergencies that may arise due to exposure to microgravity. The story is quickly told. After publication, it has been found that the mentioned article contains plagiarism, as it includes large parts of uncited material from at least two other articles, both by Dr. Balwant Rai. Although B. Rai is cited at certain spots in the article, major parts of the work are taken over verbatim and without citation. It is pretty obvious, what happened and we did not get any useful reply by the authors concerning the allegations. The amount of material which seems to be plagiarised was not done intentionally. As it was as a review article, so some of material was taken from old articles as review article always involves inclusion of review of old articles. First this article was published online and that time they did not find any problem in that. They gave me volume number and serial number. later on when it was to be published in print form then they told me about its plagiarism. If they had any such problem then they should have told me before publishing and all such problem should have not been faced by me. We contacted Balwant Rai, an Associate Professor at the Kepler Space institute and an author on the two papers that were plagiarized. We’ve also contacted Grace Baynes, the Head of Science & Scholarly Communications at Springer Nature, who is conferring with the editors of the journal to see if they can provide further comment. We’ll update with their response if they do. Googling the first three sentences of the main manuscript (not the abstract) separately gives you an impression of the problem. 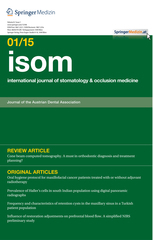 Why is the journal acronym not IJSOM?